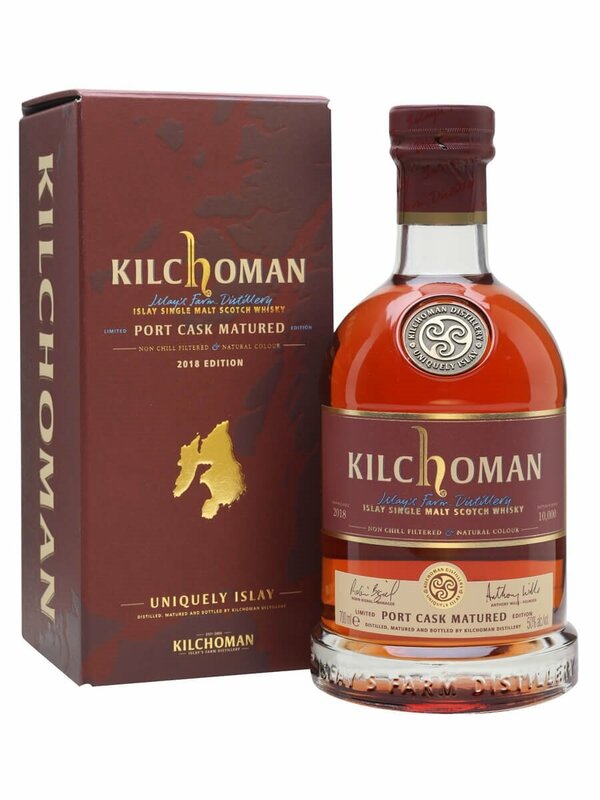 Kilchoman presented its very first Port Cask matured expression in early September. While other distilleries mostly finish port editions, Kilchoman chose a complete maturation in port pipes. The Port Cask matured is being shipped - as we speak - to retailers. It was the result of three years maturation in 20 ex-ruby port casks and bottled at cask strength, 55% ABV. This edition will be a bit of a curiosity. From the 1000 cases produced, only 150 bottles will end up in Belgium. And it does not seem to become a permanent addition to the range like Machir Bay and Loch Gorm. Unless it becomes a convincing success and they can invest in sufficient quality port casks. Colour: The colour is clearly influenced by the port pipe. It got the looks of a rosé wine and leaves an oily film on the glass. Nose: The nose is rather tingling, courtesy of the high ABV. There's definitely some smoke present on the nose. Red fruit and crème brûlée flavours bring balance. It also offers those typical Kilchoman citrus flavours, scorched grass and worn leather. Water softens its aggressive side and offers some raisins. Taste: The smoke is more ubiquitous on the palate. The port delivers flavours of aromatic tobacco, honey and red fruits: cherries and strawberries. Again it sweetens with water. Yet the smoke keeps the leading role. Raisins, honey and vanilla. Finish: The aftertaste is hot and a little spicy. Roasted peanuts. Kilchoman deviated from trodden paths with this Port Cask Matured. It's not your typical daily dram but surely an interesting discovery. Too bad my sample was a tad small. I sneaked less than a centilitre home from the Kilchoman masterclass with George and James Wills. Otherwise, I would probably have gotten more extensive tasting notes. Which raises another question: Would there be a big flavour difference between a batch that has been finished (ex-bourbon -> ex-sherry) and a batch that has been married (ex-sherry+ex-bourbon)?